Throughout OA Week October 22-28 Scholastica will be hosting a free-flowing Twitter discussion about the relationship between academic-led publishing and equitable open access using the hashtag #AcademicLedOA. Get the details below! In the current academic journal publishing system, a handful of corporate publishers control over 50% of the scholarly literature. Corporate publishers have outsized influence over how scholarship is produced and distributed and they have raised journal prices to unsustainable levels. As a result, many research institutions and scholars are unable to afford access to key journals. As we transition towards OA publishing, there are mounting concerns that if corporate publishers remain in control of the majority of research they could dominate how open systems are devised and use article processing charges (APCs) to maintain their high revenue streams. Should APCs continue rising at the current rate, OA publishing fees extracted from the academic community could soon rival the cost of serials. Such high publishing costs and centralized control over research would augment inequities in academic publishing both in terms of authorship and shaping the future OA publishing landscape. As a result, many argue more academic-led publishing initiatives are needed to counter the imbalance of power over journals and challenge inequitable publishing practices. This OA Week, we’re looking at the role of academic-led publishing in fostering an equitable OA landscape. 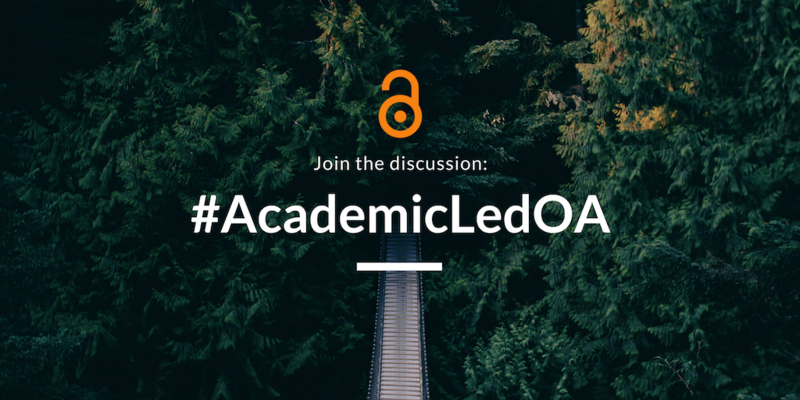 We’ll be hosting an open Twitter discussion throughout the week about the relationship between academic-led publishing and equitable OA using the hashtag #AcademicLedOA. We’ll be posting #AcademicLedOA questions via Twitter throughout OA Week to encourage free-flowing discussion. To what degree is decentralization of control over academic journals needed to make OA more equitable? Should research funders reward more grants for academic-led OA publishing initiatives rather than funding corporate APCs? Could we go from a serials crisis to an APC crisis that perpetuates inequities in academic publishing? What is the role of the community in ensuring this doesn’t happen? How can the scholarly community invite more diverse voices into formal and informal discussions about the future of OA publishing? Will “journal declarations of independence” become more commonplace in the future? What are inequities that models for funding OA publishing could recreate or reinforce if left unchecked by the scholarly community? To what extent are professional incentives (e.g. publication prestige, the Impact Factor) holding back equitability in OA publishing? What is the role of the academic community in changing this? We’ll be posting questions each day of OA Week, which you can respond to at any point. Throughout OA Week we’ll be tweeting the above questions from our Twitter account @scholasticahq using the hashtag #AcademicLedOA. Each question will start with a “Q” for question followed by a reference number (e.g. Q1, Q2…) to indicate the question order. Participants should respond with “A” for answer and the reference number for the question they’re addressing (e.g. A1, A2…). When you see a discussion question and want to respond you can reply to the tweet with A and the number of the question you’re addressing. Be sure to include the hashtag #AcademicLedOA in all of your tweets so others can find them as they follow the discussion. You can follow the #AcademicLedOA hashtag via the Twitter search bar throughout the week to see what questions are being asked and what others are saying. We hope you’ll join the discussion!